When Ian's parents separate, he moves with his mother to the city, a thousand miles away from the prairie wheat farm he calls home. With no friends and a bleak moonscape of a backyard to play in, Ian has only an old shoe box of objects from his past life to keep him company. But after he peeks through the fence to the lush garden next door, Ian is inspired to start digging his own little plot. 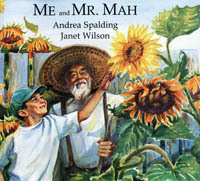 And when he meets Mr. Mah, the old man who owns the garden, Ian is surprised to learn they have a lot in common. Also displaced from the original home he misses, Mr. Mah keeps his own box of memories of his past in China. And as they share stories about their distant homes, Ian finds more than just a new friend—he finally discovers in himself the courage to accept change. 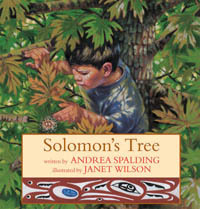 "The honesty and compassion of Spalding's tale will touch yound readers, while Wilson's sensitive and eloquent watercolors capture the special feeling of this intergenerational friendship." "The story deals with the ideas of separation and loss in a gentle but understandable way that children will immediately grasp." "Each pleasing watercolor painting...spills across to the opposite page." "This title should be considered for collections needing material on intergenerational or interracial relationships." "Artist Janet Wilson brings Andrea Spalding's story to life with her richly saturated water color style. All ages will enjoy the heartwarming tale of two drastically different people coming together in the bond of friendship. 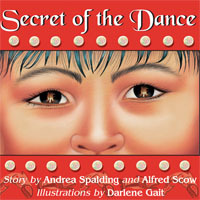 The writing of this warm, multi-cultural tale is easy enough for beginners to master and will provide enjoyment for the whole family." " . . . a sweet story of a displaced boy who finds a lush oasis and happiness i a neighbour's garden." "Grief and sadness can transcend cultural barriers." "A quietly meaningful story." " Offers seeds of tenderness." "This sensitive book is mindful of all the senses." "Wilson's illustrations are...attentive, conjuring the mood of the story, and the motions and colors found in the garden." "Janet Wilson's vivid paintings add life and colour to the story. They fit perfectly with the text . . ."
"This lovely story, told in the first person, is a bittersweet tale about how people survive upheaval and change in their lives by linking their past to their future. Janet Wilson's beautiful picture panels, which are dominated by huge nodding sunflowers and swirling earth tones, perfectly complement Andrea Spalding's gentle prose. Recommended." " . . . a moving story of a young boy, undergoing the stress of his parent's separation and eventually divorce." 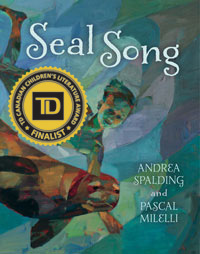 "Spalding's story nicely connects characters from different generations and cultures." " . . . the growing proximity between boy and man is beautifully captured in the parallel narratives of text and image."